Online marketplace Etsy will start offering free credit card readers to some of its U.S. sellers as part of an effort to extend its reach beyond the Internet. The dongles, which can be plugged into a smartphone or tablet, will be used in conjunction with an Etsy app to allow sellers to accept credit card and debit card purchases while hawking their wares at craft fairs and in other retail settings. Etsy says more than a third of the people who sell goods on its online marketplace who are based in the U.S. also sell their products at craft fairs. With the launch, Etsy will for the first time start earning a cut of transactions that happen away from its digital platform. Sellers using the credit card reader will pay Etsy 2.75 percent of each transaction. The readers are only available to sellers who use Etsy’s own payments platform, called Direct Checkout, to accept credit and debit card purchases on Etsy.com and on the Etsy app. Etsy declined to provide information that would be helpful in figuring out how many of its current sellers would qualify to receive the free reader. The new product will pit Etsy against other reader providers such as Square, PayPal and Amazon. 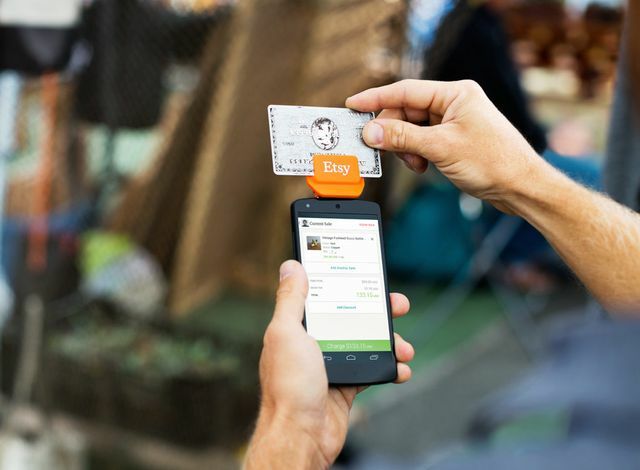 Square charges the same 2.75 percent fee as Etsy while PayPal charges 2.7 percent. Amazon is taking just a 1.75 percent cut on purchases through the end of 2015, but will raise the fee to 2.5 percent after that.